This blog can handle a WordPress REST endpoint and display its contents. 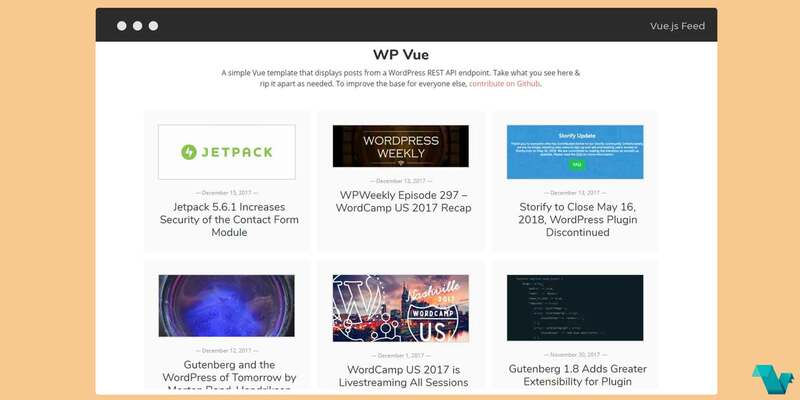 The blog in its core has Vue components but it can be modified to suit your own needs. Make sure you have yarn installed on your machine, and run yarn install. Set Your Constants Set your specific constants in the config.js file. POSTS_PER_PAGE - The default number of posts per page that will be displayed. GA_TRACKING_ID - A Google Analytics tracking ID. Run yarn run dev to spin up a running version from localhost. The app is deployed to Netlify, so it is a great place to host your own version of this project. The running app gives the user the option to change to another REST API endpoint.